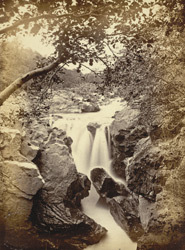 "About a mile above the Hermitage, a Fall of about 85 feet occurs at the Rumbling Bridge. Perhaps, in picturesque scenery, this cascade may be considered inferior to that at the Hermitage, but the beauties of both depend very much upon the state of the weather. The most perfect and extensive view of the district may be obtained from the summit of Craigvinean, surpassing all the others in magnificence. It affords a better conception of the collected gradeur of the whole district than at any other point. The grounds may, in some parts, appear broken and rugged, but only to be contrasted with the woods of the mighty forest which stretch out to a very great distance, and clothe the mountain sides in leafy bowers. The traveller may here form some idea of the vast extent of the forest of Athole."